At the invitation of the Irish Anti-War Movement I recently had the privilege of traveling through both the Republic of Ireland and the “north of Ireland” (part of the United Kingdom for now, but not forever according to my hosts) to meet with peace groups preparing for the worldwide demonstrations on March 20, 2004 – the anniversary of the attack on Iraq. They asked Military Families Speak Out to send a representative to speak for an American peace movement about which they seldom hear in their media and to address the issue of American troops and war materiel passing through their Shannon Airport. Beginning with a press conference on March 15 that was covered by both the Irish Times, the Republic’s equivalent of the New York Times, and the national RTE television network, I began a trip that took me to venues in Dublin, Dundalk, Drogheda, Waterford, Cork and Galway in the Republic, as well as Belfast and Derry in the north of Ireland. Turnout at meetings ranged from about 15 in Drogheda to over 150 in both Dublin and Galway. Radio interviews were done at almost every stop and it is quite likely that, thanks to the great organization of the peace activists, my message to the Irish people was heard by well over half the population. 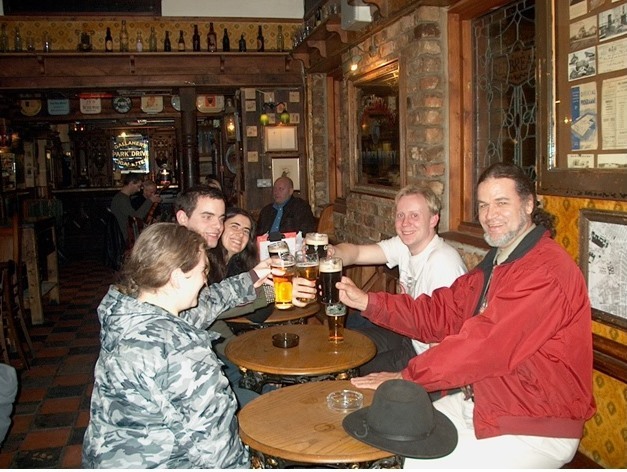 On the first night we visited a small pub in Dundalk where the February 15 anniversary of worldwide demonstrations was being celebrated as part of a “global village” for peace. The people gathered there were sharing poetry and song and candles – not to mention some Guinness stout – in that paradigmatic way that speaks of the best and truest nature of the human heart. Another great feature of the trip, which I shall never forget, was sitting at a table in Derry with the legendary civil rights activist Eamon McCann, and then later on in Galway sharing a stage with Denis Halliday , the former UN administrator of the Oil for Food program who resigned his post to protest how UN sanctions were killing thousands of Iraqi civilians. I could only be thankful to have met these two stalwarts for peace in their nation and our world. Who could have known a little over a year ago when I agreed to be a parent plaintiff in the MFSO lawsuit (Doe v. Bush) against George W. Bush (to force a Congressional declaration of war and, hopefully, stop the war through a serious reconsideration of the casus belli) that my life would soon cross paths with such peace heroes? Wherever I traveled in Ireland I was happy to tell my audiences about a broad-based peace movement in America, one which I have witnessed personally in several demonstrations numbering in the tens of thousands. And I was happy to tell them that this peace movement has been supported and amplified by the growth of progressive groups on the Internet like UnitedforPeace.org, MoveOn.org, Truthout.org, CommonDreams.org, TrueMajority.org, WorkingforChange.com and many others. We even talked about the upcoming presidential election that my hosts, as much as any progressives I know in America, are fervently hoping will be the end of George W. Bush and the extreme right wing ideologues that have our government in their grip. We then went deeper and talked soberly of whether a change in Administration will be a fundamental change in how America behaves in the world, a topic I will have more to say about below. From my new Irish friends I learned that over 125,000 American troops passed through Shannon in the past year along with their weapons and U.S. warplanes. Not surprisingly, the government of Taoiseach (Prime Minister) Bertie Ahearn at first denied the use of Shannon for these purposes but had to admit the truth when peace activists like the Pitstop Ploughshares went to Shannon on February 3, 2003 and acted to disarm an American warplane. Twelve days later on February 15, during the largest global expression of anti-war feeling in world history, over 100,000 Irish citizens demonstrated in Dublin against the war. That was an astounding turnout in a country of 3.2 million people, proportionally equivalent to 8.7 million Americans turning out for a single demonstration. The turnout stunned the Ahearn government, but it has shown that it is not without resources or will to respond. Since the Dublin peace march the Ahearn government has followed suit with George Bush in clamping down on the civil liberties of its citizens in order to suppress anti-war activists. The government no longer allows the posting of placards in public areas to announce public assemblies (they used to be okay if they were removed within three days after the event). More insidiously, it has banned peace activists from entering County Clare where Shannon Airport is located, including one person whose home is in County Clare. It was a terrific trip for me but also a sobering one. As I traveled I read the new book by Kevin Phillips entitled American Dynasty, which is mainly about the rise and consolidation of the “military-intelligence-industrial complex” over the past 100 years. That “complex” has become a scourge upon our nation and the world, driving us into numerous wars that principally served the business interests of its powerful members, although the American people’s complacency in accepting the spoils of these wars does not go without mention. Phillips carefully unpacks the complicated history that has left us facing precisely the deep peril that President Dwight D. Eisenhower warned against as he left office in 1961 in what has come to be called his “Cross of Iron” speech. While the book shows how the Bush and Walker families (as in “George Herbert Walker Bush,” the U.S. President from 1989 to 1993) have for over four generations been at the center and the apex of this complex, the deeper lesson of the book is that America as a democracy has been deeply wounded by these sinister powers-that-be, and that these powers persist whether or not we have a Republican or a Democratic Administration. This sadly is also what I was learning from my Irish friends. We had long and deep discussions about the human and ecological ravages of a misdirected globalization led by the United Sates and the multinational corporations that provide the mother’s milk of our politics. They agreed with me, but then they said back to me, “It is about more than standing up against this or that war that is sponsored by America; it is about joining with an international grassroots opposition to war and the exploitation of the earth that could lead to the demise of our species within this century.” So it has become for them and me a matter of acting to give our grandchildren a chance to have grandchildren of their own. It has become a matter of standing up to the religious fundamentalists in our nation at the base of the George W. Bush Republican Party who are inclined to look forward to the end of the world, not to work against it. It has become a matter of learning about new movements such as the World Social Forum that brings together grass roots peace and justice activists not only to oppose the worst aspects of globalization but also to discover a way to a sustainable future. At the last World Social Forum they endorsed a worldwide demonstration against war and occupation on March 20, and the Irish peace activists are working hard to hold up their end of that, but they know it goes deeper and further than bringing people into the streets on March 20. So at the end my trip to Ireland for MFSO was a life-changing experience for me. My conversations with Irish peace activists, layered over by the Phillips book, have led me to a new dedication of effort and time and treasure to saving the planet for future generations. It has become nothing less than that for me. Shortly after arriving home I heard the very good news that my stepson John had been sent home from Iraq and is out of there for good. Soon he will return to the states and finish out a 20-year military career. The immediate danger for him is over. Yet as much as I rejoice in that news, I cannot help but know after my trip to Ireland that the danger to him and his children still exists. It is not a danger from this particular war, but it is the proclivity to war, one could even say the imperative of war at the heart of our culture, and it is the ruinous exploitation of the earth for profit that threatens the future of his family and the human family. This is where I must next carry the struggle. With the grassroots of this earth, may we prevail in that struggle. Recently, I had the occasion to go on retreat with my church where at some point we were all asked to provide an image of how we see ourselves. I could not think of anything other than a simple prayer, a few words for the future. Now, after being a part of that lovely evening in Dundalk, Ireland when those present shared song and poetry to encourage one another in their peacemaking, I have become bold enough to share this short reflection with my MFSO family and other friends who may read it. Let me be a light of peace in this world. without taking on the aspects of war. Call me to a way of peace that calls us back to You. that lies before my grandchildren. wherein their lives become a light for generations to come. Be the Being and the All of all my being. This I pray in Jesus’ name. Or in the name of Allah, or in the name of YHWH, or the Buddha, or even just in the name of our poor, fractured and failing humanity. However it is said, however conceived at the heart of our Common Creation, from my journey in Ireland I bring this message of encouragement to light a new way. Blessings to all, and may all the troops come home soon! 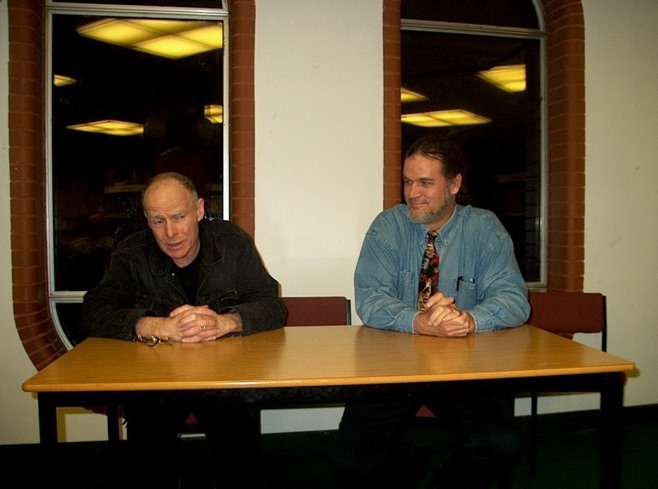 With Eamon McCann in Derry, the north of Ireland. Relaxing in a Belfast pub after a day of working for peace. Irish Anti-War Movement, http://irishantiwar.org/index.adp; thanks go especially to my host Kieran Allen. My name is Dr. J. Stephen Cleghorn. I am now a resident of Baltimore, MD. I continue to own a 50-acre certified organic farm in Jefferson County, PA that I operated with my late wife Lucinda between 2005 and 2011 when she passed away from cancer. The farm is now under lease to organic farmers and protected by "The Dr. Lucinda Hart-Gonzalez Conservation Easement” which protects it for organic agriculture and against the threats of industrial development that would violate the Rights of Nature. The blog’s name is taken from the writings of Saint Augustine who believed “Hope” to be the greatest of spiritual gifts. And, says Saint Augustine, Hope has two lovely daughters: Anger and Courage. Anger so that what must not be may not be; courage so that what should be can be. Anger and Courage. Now in late 2016, after the election of Donald Trump as President of the United States, these are the spiritual gifts that must come to the fore if we are to have “Hope” for a loving culture and a sustainable world for future generations. When I first created this blog it was focused on the extreme form of fossil fuel extraction known as “fracking” that was threatening much of the state of Pennsylvania and many other parts of the United States. At the root of that struggle was and is a struggle to halt and reverse climate change. Now the struggle has turned to resisting an incoming Trump Administration that is an existential threat to the climate with its plans to ramp up extraction and use of fossil fuels. This blog will be about having the courage to stand up to the massive global corporations that would ruin our planet and its climate, take their profits and leave the mess to future generations of to clean up. We need to rise up, my friends, and be not afraid.